Annie's Place, a beautiful canal front home with private boat dock located just 1/2 block from the beach in the Perdido Key State Preserve. 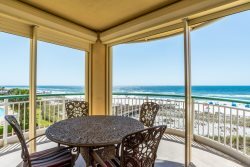 Enjoy colorful sunsets or spectacular views of the beach from your large balcony. You also have a private canal boat dock. Bring your water noodle and float mindlessly in the canal--who knows, one of our resident dolphins may pay you a visit. The property is perfect for fishermen, boaters, and beachcombers.